Activated carbon filters are used for water purification in water systems and application of these filters can increase the efficiency of water system. The activated carbon filter is used to remove chlorine and organic matter from the water. It also removes the color and odor from the water hence the turbidity of the water is also removed. It plays an important role in water purification systems where chlorine is added for decontamination. ACF is unable to remove the microbes and hardness. Activated carbon filter contains carbon particles of various sizes ranging from 10 to 50 mesh. Activated carbon is prepared from coconut shells by burning in the absence of oxygen generally in an atmosphere containing nitrogen or another inert gas. This carbon is then activated by steam or chemical methods. In steam activation, this carbon is heated at 750- 950°C in the presence of steam. Steam activated carbon contains very fine pore size that is ideal for adsorption of components from water. In chemical activation of carbon, it is mixed with a paste of zinc chloride and heated at 600-800°C. Chemically activated carbon has a bigger pore size and ideal for adsorption of larger molecules from water. Chlorine and organic compounds are adsorbed on the surface of activated carbon particles into their small pores. Reactivation of the carbon required again to increase the efficiency of activated carbon filter frequently. There are some factors that affect the efficiency of the carbon filters such as contact time of water on carbon bed, the concentration of contamination, temperature and pH of water. At high temperature activated carbon filter is less effective than low temperature. pH of water also affects the adsorption of contaminants. A 20 % more activated carbon surface is required when we increase pH by one unit from 7. 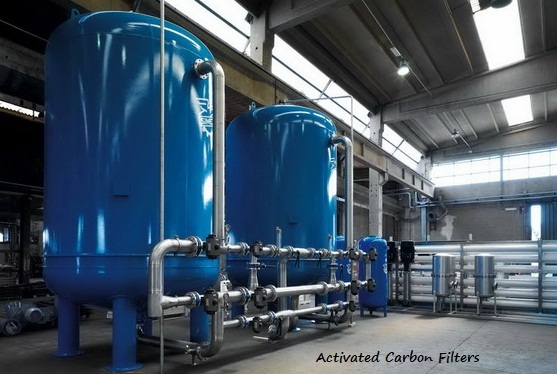 Sanitation of activated carbon filters should be done frequently with the steam because carbon supports the growth of microbes and it can contaminate the water systems. if possible explain Re activation procedure for carbon particle at plant level to increase the efficiency, b'coz high temp heating and all is not possible, pl. suggest a chemical process.